Dr. Tyler Peterschmidt joined the team at Jenson Family Dental in June 2018 after practicing for 4 years in a combination of Private Practice and Public Health Dentistry. He attended Oregon State University and graduated in 2010 with a degree in General Science. 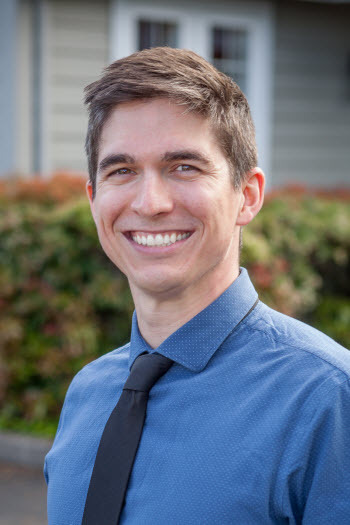 Dr. Tyler graduated from Oregon Health Sciences University, School of Dentistry in 2014 and promptly moved to Eugene to begin his dental career. He has come to call Eugene home and looks forward to building life-long relationships with his patients and the community. He is very passionate about providing quality dental care while creating a warm and welcoming environment. Dr. Tyler participates in a variety of activities and hobbies to keep him occupied. He enjoys spending time outdoors with his wife Carly and their beloved golden retriever, Murphy. They enjoy exploring Oregon’s beauty and also enjoy traveling to new places across the globe. Tyler is an avid sports fan and enjoys playing a variety of sports including basketball, soccer, ultimate frisbee, and mountain biking.